Will fit most angle plug heads. Can be run upside down to gain clearance but will require relocating water temperature sending unit. Note: This product is Not legal for Street or Off Highway use in California or in states that have adopted California Emissions Regulations and is only intended for Closed Course Competition use, except 1965 and Older US manufactured California Certified vehicles, 1967 or older US manufactured Federally Certified vehicles, or 1967 and older Foreign manufactured vehicles which may have any aftermarket add-on or modified part installed as long as the vehicle can still meet the tailpipe emission standards for the year of the vehicle and retain any original or retrofit crankcase control (PCV) devices and NOx device required for the year of the vehicle. 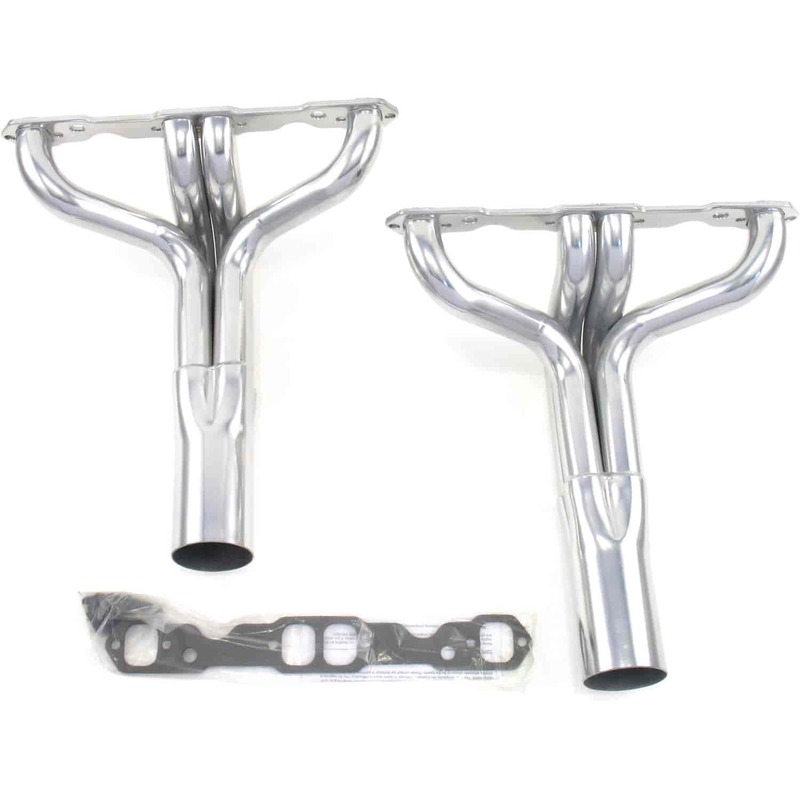 Patriot offers affordable racing headers for many applications in the popular IMCA Modified, Sprint Car, Late Model Sportsman, Street Stock, Mini-Stock and Pony Car classes. Patriot headers use precision machined flanges and lightweight but strong 18 gauge tubing. Mandrel bent primaries and long transition collectors reduce backpressure for increased exhaust velocity. Some applications are available with a stepped pipe design to help broaden the torque curve for better corner acceleration. Available with our optional metallic ceramic thermal barrier coating which is corrosion and heat resistant up to 1600º F providing increased thermal fatigue protection and lower under hood temperatures.